If you’ve always dreamed of taking a true cowboy holiday – full of adventure and camaraderie – then you need to saddle up to some of Canada’s best cowboy guest ranches, right here in British Columbia. Some of our member guest ranches are actually working cowboy guest ranches, where you can try your hand at typical cowboy activities and cattle work, including cattle drives, round-ups, horse drives, and even cattle branding. Plus, our ranches in Canada’s cowboy country feature huge tracts of private and crown land, giving you nearly endless ranges to explore on your cowboy vacation. Of course, a holiday on a cowboy guest ranch goes beyond cattle work. You’ll also get a hearty serving of Western Canadian cowboy hospitality our members are know for – to make up a perfect horse riding holiday. Just because you’re on a cowboy holiday doesn’t mean you have to rough it. All of our members are committed to providing a comfortable, clean, homelike atmosphere. Some even offer luxury guest ranch amenities. 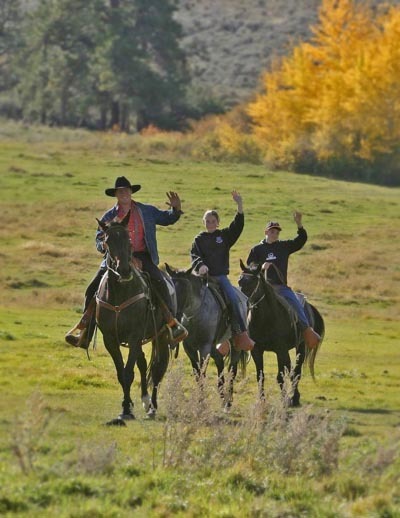 All of our cowboy guest ranches and dude ranches have horses available to accommodate the needs of all guests who want to ride – regardless of their experience level – and will carefully match you to the right horse to suit your needs. Many will also let you be as involved as you like in your horse’s care during your stay. Our horses are very well cared for, and all of our members are focused on providing you with a memorable cowboy vacation. 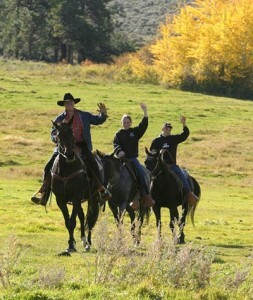 You can use our amenity search tool to find the best cowboy guest ranches in BC. If you want specific details about each ranch’s cowboy activities, just contact us and we’ll help you find the perfect cowboy vacation for your holiday needs. To start planning your next cowboy holiday, check out our member ranches today!